FREDERICKSBURG, Va. & FRAMINGHAM, Mass. -- Gulf Oil LP has announced its continued growth in Virginia by signing a branded distributor partnership with Anderson Oil Co., Fredericksburg. Since Jan. 12, 2010, the date when the title and rights to the brand were acquired from Chevron, Gulf has added more than 300 new branded sites to the Gulf family. Anderson Oil will begin work right away, rebranding over two-dozen motor fuel outlets in the Greater Fredericksburg and Richmond areas from Chevron, Texaco and Pure to the new Gulf "Sunrise" image. "My family has fond [image-nocss] memories of the Gulf brand. Gulf is a company that is dedicated to value and loyalty, and we are excited to rejoin the family," said Mark Anderson, president and owner of Anderson Oil. "One of the most gratifying elements of Gulf's geographic expansion continues to be learning about the long history and legacy that Gulf shared with many of our re-established branded partners," said Gulf Oil senior vice president and chief sales and marketing officer Rick Dery. "By the end of my first meeting with Mark Anderson, during which I learned of Anderson Oil's historical ties to Gulf, it was as if I had known him and his family's business for decades." Dery added, "I continue to be humbled by the incredible reception that we receive by companies like Anderson Oil." In January, Gulf Oil acquired from Chevron all rights, title and interest to the Gulf gasoline brand in the United States, and has announced rebranding deals in several states. 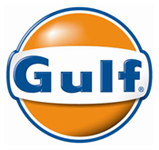 Gulf Oil returned to Virginia by announcing in April a branded distributor partnership with Milo C. Cockerham Inc., which began rebranding several former Chevron motor fuel outlets in southwest Virginia to the new Gulf "Sunrise" image. This represents the first time since 1986 that a Gulf Oil branded gas station will operate in Virginia. Gulf Oil president and chief operating officer Ron Sabia, said, "Our continued growth in the Old Dominion state reinforces Gulf's long-term commitment to the Mid-Atlantic region. With more than five million drivers in Virginia, we remain committed to offering the best high-quality service to the driving public and strive to be the premium gasoline retailer nationwide." Gulf Oil, based in Framingham, Mass., is now a national branded supplier of motor fuels throughout the United States and its territories. It remains one of the Northeast's largest wholesalers of refined petroleum products. Gulf Oil distributes motor fuels through a network of more than 2,000 branded gasoline retail centers, 12 proprietary oil terminals and a network of more than 70 other supply terminals. It supplies gasoline, heating oil, diesel fuel, jet fuel and kerosene through its terminal network. Through its unbranded subsidiary, Great Island Energy, Gulf Oil also supplies petroleum products as well as risk management and financial services to industrial, commercial and independent retail firms.